Queen Victoria’s last child was very dominated by her mother. Beatrice was companion and secretary to the head of the British Empire. Learn of her life, marriage, children, widowhood, service and legacy. All these almost wholly on the Isle of Wight. A gentle stroll through the meadows and woods overlooking Newtown Harbour to listen to the dawn chorus and nature awakening. Finish with a drink and breakfast at the visitor point. An historical walk looking at buildings and places associated with Queen Victoria in East Cowes, but not Osborne House! The walk ends at Whippingham Church with a tour of the church yard looking at graves of the Queen’s servants buried there. A wonderful stroll around the secretive woodlands of Quarr Abbey. This very gentle short walk will probably involve feeding some pigs and having a cake in the Quarr Abbey Café! Anecdotal circular walk to visit the site of the legendary 1969 Isle of Wight “Dylan” Festival, plus other landmarks in Wootton’s musical heritage, including The Sloop Folk club and locations from the film “That’ll be the Day”. 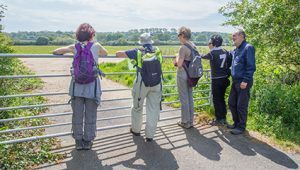 A circular walk along lanes, through countryside and beside the Medina River exploring some of Whippingham’s historical past, especially the association with Queen Victoria. Whippingham was her Island Village. Join the owners of Briddlesford dairy farm as they walk you through the history of Wootton before discovering the secrets of milk processing on the Isle of Wight. Enjoy some delicious local produce & tasty treats in the farms café for lunch before returning back across the fields to Wootton Common. A gentle wander through the village of Newtown with tales of the folk who left their mark here – from Elizabeth I and George Canning to the infamous Ferguson Gang and the Seabroke family in the 20th century. Castle Copse is a nature haven in the centre of East Cowes. Join Ed the Ranger to find out about its history, management and what you might see there. 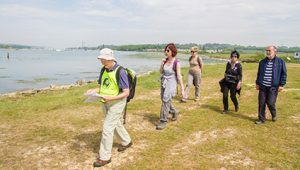 Join the Isle of Wight Long Distance Walkers Association on their annual three day walk around the Island.